There is not much green in the winter landscape of the Great Plains. 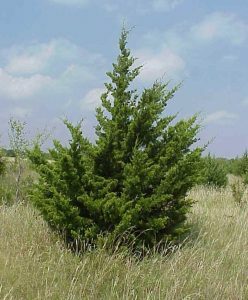 In fact Kansas has only one native evergreen tree. 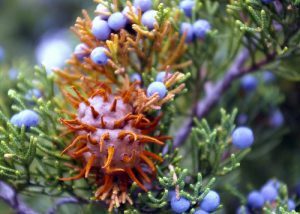 It is called the Eastern Red Cedar. All other native trees in Kansas lose their foliage in the winter, so they do not provide much shelter from winter weather. Thus the Eastern Red Cedar becomes a vital source of shelter for many birds and mammals when it gets real cold and nasty. If you are looking at a female, you will find little blue balls on the branches. These are the fruits of the tree. Smash one between your fingers and you will notice a pungent odor as well as finding one to four seeds inside. Does this smell like something you would like to eat? If you see any birds eating these berries, you will notice that they don't exactly savor the sauce, but just gobble the little treats down. The seeds pass on through the bird's gut unharmed and are "planted" elsewhere as they move about. This is a typical method that plants use to scatter their seeds. Virtually all the cedars growing in pastures get planted this way. A careful inspection will reveal the female flowers, which are small spiky structures. In the photo you can see two just above the cluster of berries (red arrow). Often you will find a hard brown growth on the branches that can vary in size from a grape to a walnut. This is a fungus called the Cedar-Apple Rust. [Gymnosporangium juniperi-virginianae] In spring, when the first warm rains fall, these structures sprout orange spaghetti-like fingers as they prepare to release their spores. The spores float through the air until (if they are very lucky) they land on an apple tree, where they make orange spots on the leaves and fruits. Orchard growers don't appreciate this much, but it ordinarily does little harm to the apple trees. 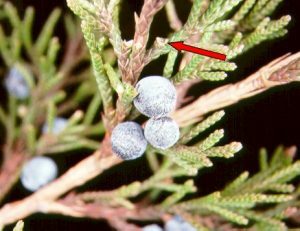 Your cedar may be "decorated" with little silk sacks that have the cedar's own scaly foliage attached on the outside of them. These are made by the larvae of a moth called the Bagworm Moth, [Thyridopteryx ephemeraeformis] which feeds on the foliage and uses its little sack as camouflage from predators. If it was inhabited by a male, the remains of his pupal skin (a dark, crisp shell) may still be hanging out the bottom of the bag. The male has wings and flies to the female, who dies within her bag after her eggs are fertilized. If you can feel a small lump within the bag, cut it open and you will find the remains of the female. The eggs are within her little corpse. The babies hatch the following spring and crawl out to begin the process anew. If you are trying to protect a tree from the bagworm moth, winter is the perfect time to do so without using chemicals. Just pick all of the old bags off the tree and trash them. No eggs, no bagworms, no problem! 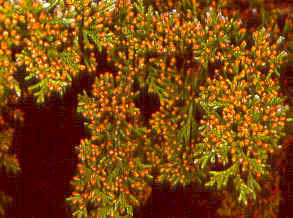 The overall color of cedars varies from green to bluish-green to bronze. The scaly foliage can be very spiky or relatively smooth. The bark has flat grey ridges and readily peels off in strips. It is a favorite nest-building material of the Cardinal. The wood has long been a favorite for constructing trunks and decorative boxes. It has a beautiful marbled, reddish color and is pleasantly aromatic.